We’re all familiar with scenes of the Apollo astronauts bounding across the lunar surface in the low gravity on the Moon, where gravity (g) is 0.17 of the gravity on the Earth’s surface. Driving the Apollo lunar rover kicked up some dust, but otherwise proved to be a practical means of transportation on the Moon’s surface. 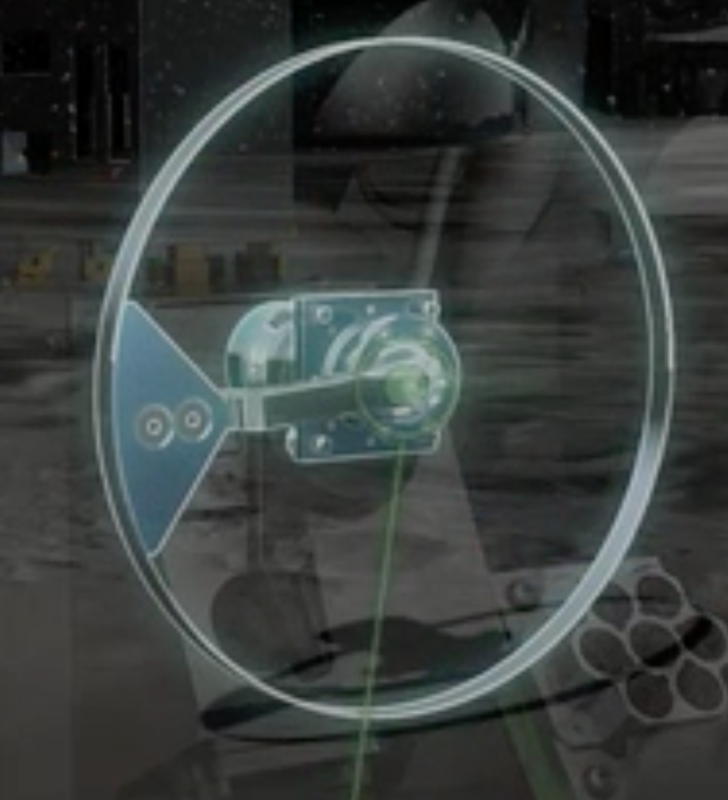 While the Moon’s gravity is low relative to Earth, techniques for achieving lunar orbit have been demonstrated by many spacecraft, many soft landings have been made, locomotion on the Moon’s surface with wheeled vehicles has worked well, and there is no risk of flying off into space by accidentally exceeding the Moon’s escape velocity. Spacecraft require efficient propulsion systems and precise navigation along complex trajectories to rendezvous with the small body and then move into a station-keeping position or establish a stable orbit around the body. Landers require precise navigation to avoid hazards on the surface of the body (i.e., craters, boulders, steep slopes), land gently in a specific safe area, and not rebound back into space after touching down. 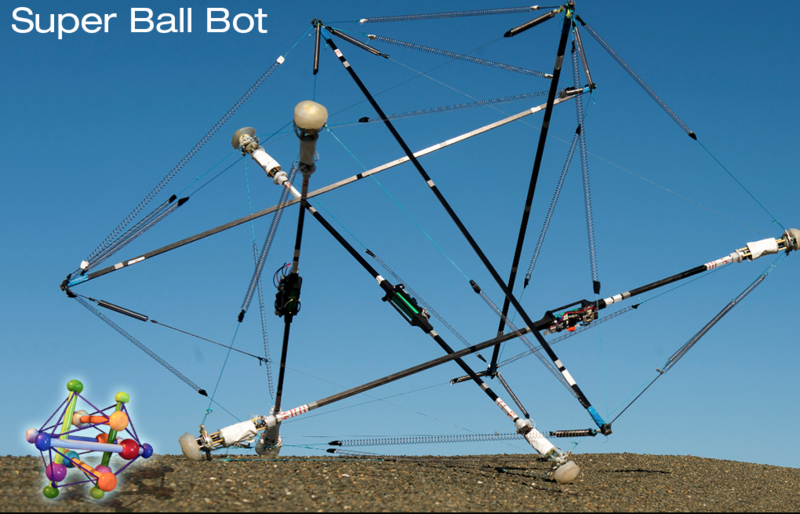 Rovers require a locomotion system that is adapted to the specific terrain and microgravity conditions of the body and allows the rover vehicle to move across the surface of the body without risk of being launched back into space by reaction forces. Many asteroids and comets are irregularly shaped bodies, so the surface gravity vector will vary significantly depending on where you are relative to the center of mass of the body. 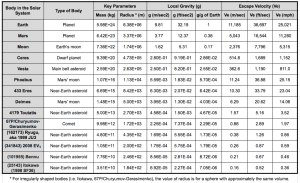 Note how weak the gravity is on the small bodies in this table. 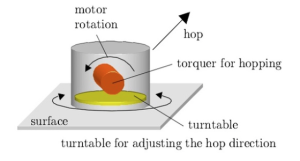 These are very different conditions than on the surface of the Moon or Mars where the low gravity still allows relatively conventional locomotion. 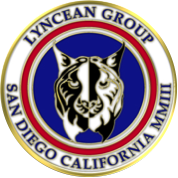 As noted in my 31 December 2015 post, the “U.S. Commercial Space Launch Competitiveness Act,” which was signed into law on 25 November 2015, opens the way for U.S. commercial exploitation of space, including commercial missions to asteroids and comets. Let’s take a look at missions to these microgravity worlds and some of the unique issues associated with visiting a microgravity world. In addition, China’s Chang’e 2 mission demonstrated its ability to navigate to an asteroid intercept after completing its primary mission in lunar orbit. JAXA’s Hayabusa 2 mission currently is enroute to asteroid rendezvous. Following is a short synopsis of each of these missions. NASA’s NEAR-Shoemaker Mission (1996 – 2001): This mission was launched 17 February 1996 and on 27 June 1997 flew by the asteroid 253 Mathilde at a distance of about 1,200 km (746 miles). 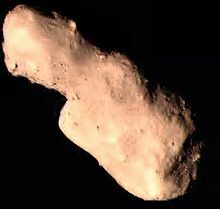 On 14 February 2000, the spacecraft reached its destination and entered a near-circular orbit around the asteroid 433 Eros, which is about the size of Manhattan. After completing its survey of Eros, the NEAR spacecraft was maneuvered close to the surface and it touched down on 12 February 2001, after a four-hour descent, during which it transmitted 69 close-up images of the surface. Transmissions continued for a short time after landing. NEAR-Shoemaker was the first man-made object to soft-land on an asteroid. JAXA’s Hayabusa Mission (2003 – 2010): The Hayabusa spacecraft was launched in May 2003. 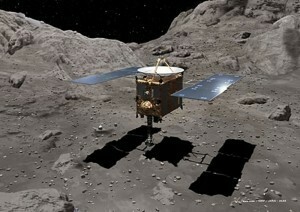 This solar-powered, ion-driven spacecraft rendezvoused with near-Earth asteroid 25143 Itokawa in mid-September 2005. 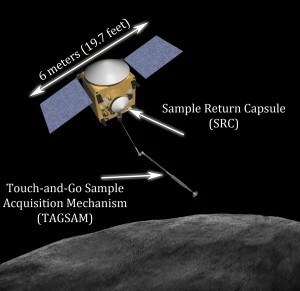 Hayabusa carried the solar-powered MINERVA (Micro/Nano Experimental Robot Vehicle for Asteroid) mini-lander, which was designed to be released close to the asteroid, land softly, and move across the surface using an internal flywheel and braking system to generate the momentum needed to hop in microgravity. However, MINERVA was not captured by the asteroid’s gravity after being released and was lost in deep space. In November 2005, Hayabusa moved in from its station-keeping position and briefly touched the asteroid to collect surface samples in the form of tiny grains of asteroid material. The spacecraft then backed off and navigated back to Earth using its failing ion thrusters. Hayabusa returned to Earth on 13 June 2010 and the sample-return capsule, with about 1,500 grains of asteroid material, was recovered after landing in the Woomera Test Range in the western Australian desert. ESA’s Rosetta Mission (2004 – present): The Rosetta spacecraft was launched in March 2004 and in August 2014 rendezvoused with and achieved orbit around irregularly shaped comet 67P/Churyumov-Gerasimenko. This comet orbits the Sun outside of Earth’s orbit, between 1.24 and 5.68 AU (astronomical units; 1 AU = average distance from Earth’s orbit to the Sun). 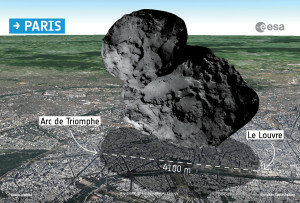 The size of 67P/Churyumov-Gerasimenko is compared to downtown Los Angeles in the following figure. Currently, Rosetta remains in orbit around this comet. The lander, Philae, is on the surface after a dramatic rebounding landing on 12 November 2014. Anchoring devices failed to secure Philae after its initial touchdown. The lander bounced twice and finally came to rest in an unfavorable position after contacting the surface a third time, about two hours after the initial touchdown. Philae was the first vehicle to land on a comet and it briefly transmitted data back from the surface of the comet in November 2014 and again in June – July 2015. NASA’s Dawn Mission (2007 – present): Dawn was launched on 27 September 2007 and used its ion engine to fly a complex flight path to a 2009 gravitational assist flyby of Mars and then a rendezvous with the large asteroid Vesta (2011 – 2012) in the main asteroid belt. 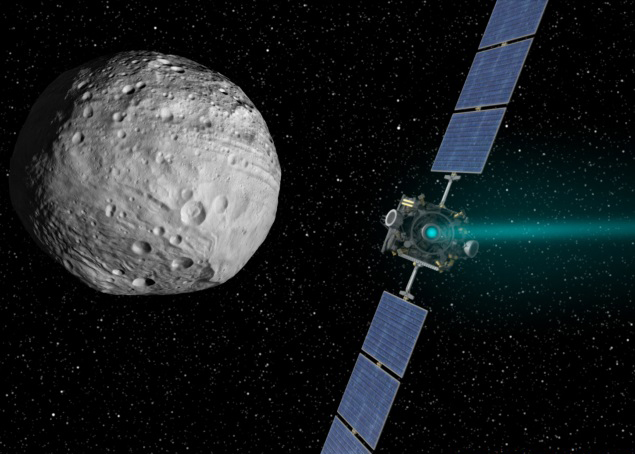 Dawn spent 14 months in orbit surveying Vesta before departing to its next destination, the dwarf planet Ceres, which also is in the main asteroid belt. 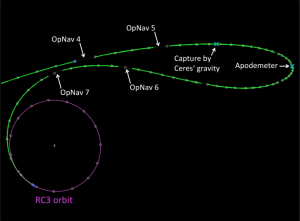 On 6 March 2015 Dawn was captured by Ceres’ gravity and entered its initial orbit following the complex trajectory shown in the following diagram. 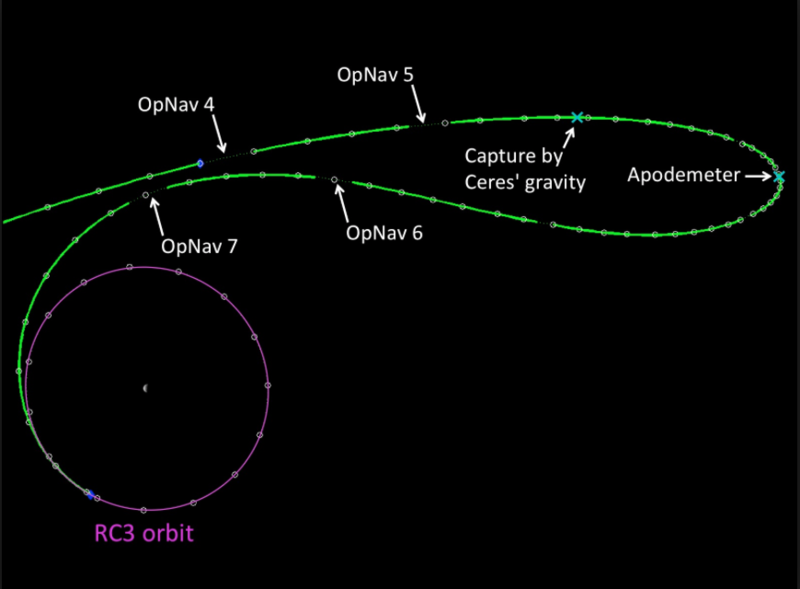 Dawn is continuing its mapping mission in a circular orbit at an altitude of 385 km (240 miles), circling Ceres every 5.4 hours at an orbital velocity of about 983 kph (611 mph). The Dawn mission does not include a lander. See my 20 March 2015 and 13 Sep 2015 posts for more information on the Dawn mission. CNSA’s Chang’e 2 extended mission (2010 – present): The China National Space Agency’s (CNSA) Chang’e 2 spacecraft was launched in October 2010 and placed into a 100 km lunar orbit with the primary objective of mapping the lunar surface. After completing this objective in 2011, Chang’e 2 navigated to the Earth-Sun L2 Lagrange point, which is a million miles from Earth in the opposite direction of the Sun. In April 2012, Chang’e 2 departed L2 for an extended mission to asteroid 4179 Toutatis, which it flew by in December 2012. JAXA’s Hayabusa 2 Mission (2014 – 2020): The JAXA Hayabusa 2 spacecraft was launched on 3 December 2014. This ion-propelled spacecraft is very similar to the first Hayabusa spacecraft. 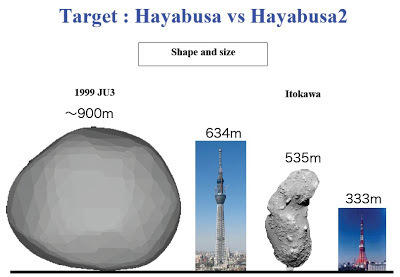 Its planned arrival date at the target asteroid, 1999 JU3 (Ryugu), is in mid-2018. 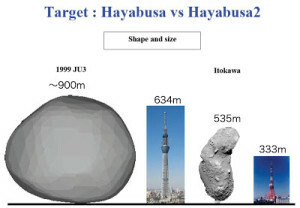 As you can see in the following diagram, 1999 JU3 is a substantially larger asteroid than Itokawa. The spacecraft will spend about a year mapping the asteroid using Near Infrared Spectrometer (NIRS3) and Thermal Infrared Imager (TIR) instruments. 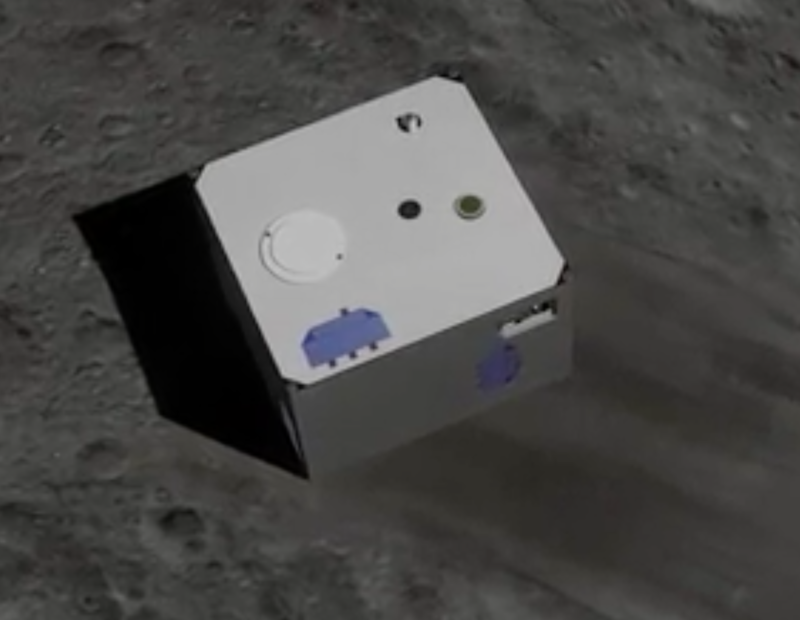 Hayabusa 2 includes three solar-powered MINERVA-II mini-landers and one battery-powered MASCOT (Mobile Asteroid Surface Scout) small lander. 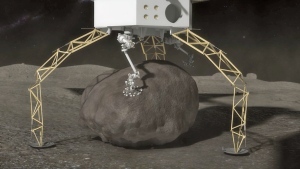 All landers will be deployed to the asteroid surface from an altitude of about 100 meters (328 feet) so they can be captured by the asteroid’s very weak gravity. The 1.6 – 2.5 kg (3.5 – 5.5 pounds) MINERVA-II landers will deliver imagery and temperature measurements. 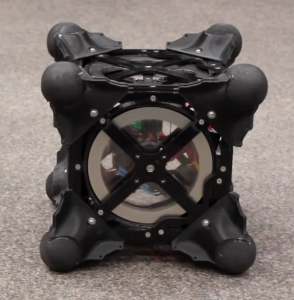 The 10 kg (22 pound) MASCOT will make measurements of surface composition and properties using a camera, magnetometer, radiometer, and infrared microscope. 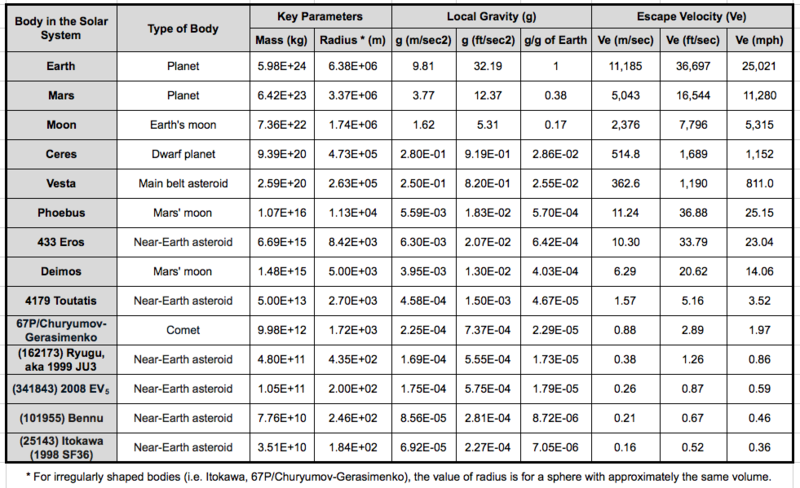 All landers are expected to make several hops to take measurements at different locations on the asteroid’s surface. NASA OSIRIS-REx: This NASA’s mission is expected to launch in September 2016, travel to the near-Earth asteroid 101955 Bennu, map the surface, harvest a sample of surface material, and return the samples to Earth for study. After arriving at Bennu in 2018, the solar-powered OSIRIS-Rex spacecraft will map the asteroid surface from a station-keeping distance of about 5 km (3.1 miles) using two primary mapping instruments: the OVIRS Visible and Infrared Spectrometer and the OTRS Thermal Emission Spectrometer. Together, these instruments are expected to develop a comprehensive map of Bennu’s mineralogical and molecular components and enable mission planners to target the specific site(s) to be sampled. 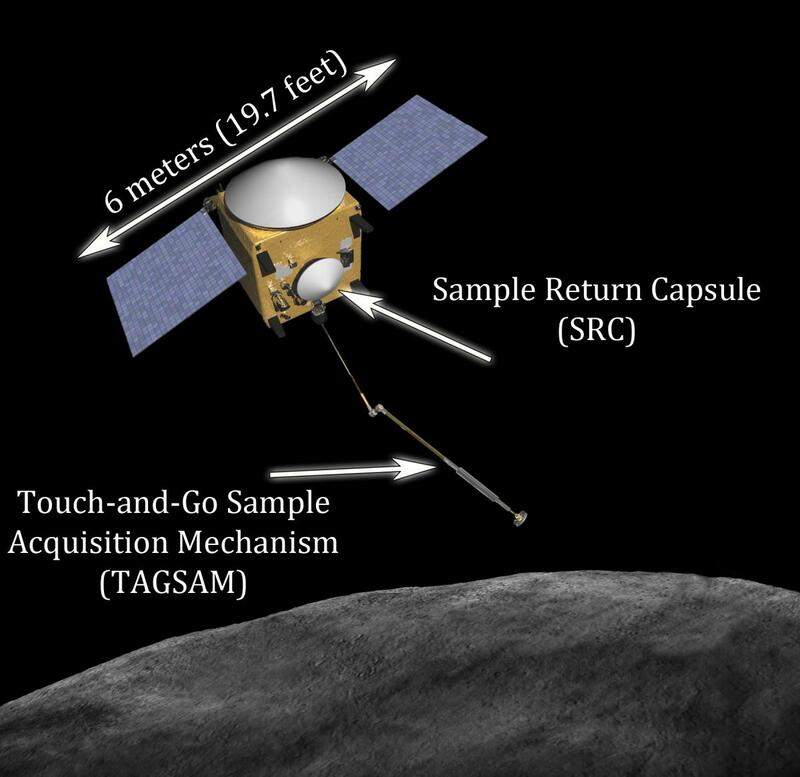 In 2019, a robotic arm on OSIRIS-REx will collect surface samples during one or more very close approaches, without landing. These samples (60 grams minimum) will be loaded into a small capsule that is scheduled to return to Earth in 2023. NASA Asteroid Redirect Mission (ARM): This mission will involve rendezvousing with a near-Earth asteroid, mapping the surface for about a year, and locating a suitable bolder to be captured [maximum diameter about 4 meters (13.1 feet)]. The ARM spacecraft will land and capture the intended bolder, lift off and deliver the bolder into a stable lunar orbit during the first half of the next decade. 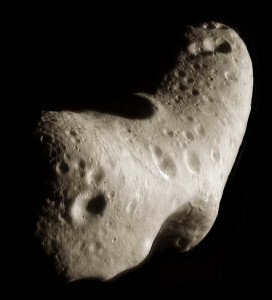 The current reference target is known as asteroid 2008 EV5. OK, you’ve landed on a small asteroid, your spacecraft has anchored itself to the surface and now you want to go out and explore the surface. If this is asteroid 2008 EV5, the local gravity is about 1.79 E-05 that of Earth (less than 2/100,000 the gravity of Earth) and the escape velocity is about 0.6 mph (1 kph). Just how are you going to move about on the surface and not launch yourself on an escape trajectory into deep space? Hoppers / tumblers: Hoppers are designed to move across a surface using a moving internal mass that can be controlled to transfer momentum to the body of the rover to cause it to tumble or to generate a more dramatic hop, which is a short ballistic trajectory in microgravity. 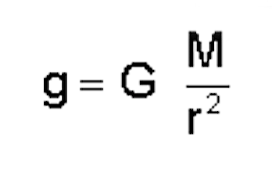 The magnitude of the hop must be controlled so the lander does not exceed escape velocity during a hop. 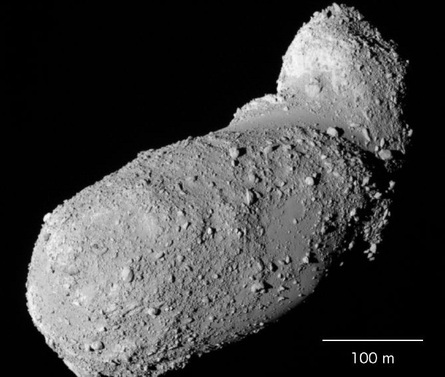 JAXA’s MINERVA-II and MASCOT asteroid landers both are hoppers. 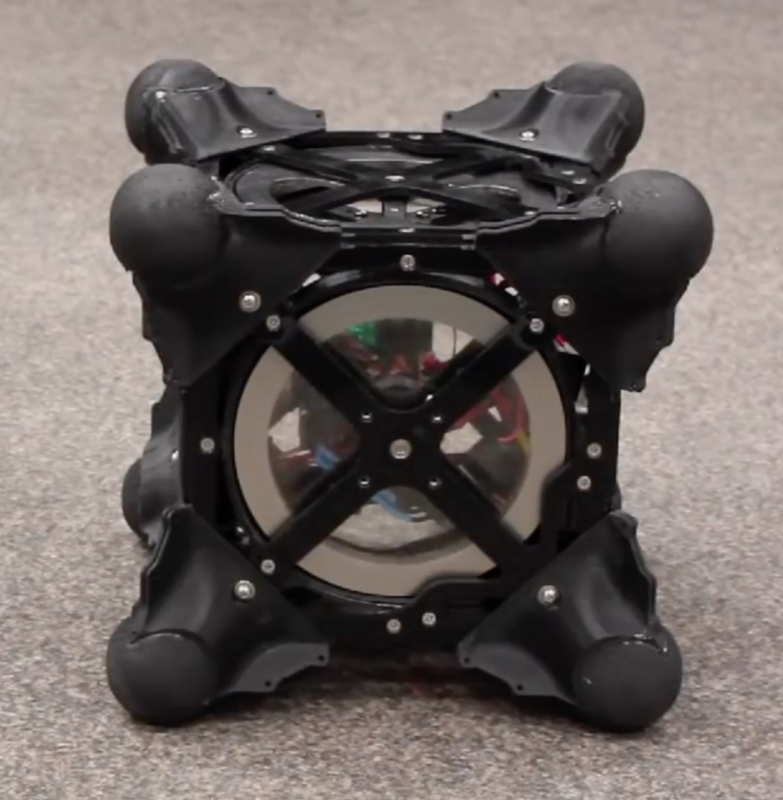 NASA is examining a class of microgravity rovers called “hedgehogs” that are designed to hop and tumble on microgravity surfaces by spinning and braking a set of three internal flywheels. Cushions or spikes at the corners of the cubic body of a hedgehog protect the body from the terrain and act as feet while hopping and tumbling. 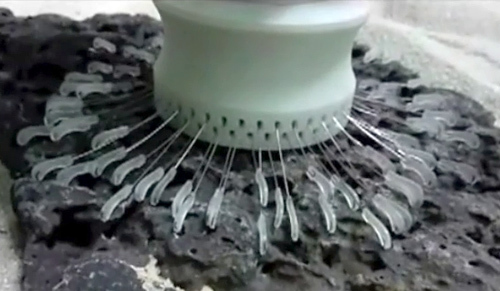 Grippers: Without having a grip on a microgravity body, a rover cannot use sampling tools that generate a reaction force on the rover (i.e., drills, grinders, chippers). 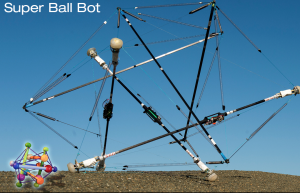 For such operations to be successful a rover needs an anchoring system to secure the rover and transfer the reaction loads into the microgravity body. An approach being developed by Jet Propulsion Laboratory (JPL) involves articulated feet with microspine grippers that have a large number of small claws that can grip irregular rocky surfaces. Missions to small bodies in our Solar System are very complex undertakings that require very advanced technologies in many areas, including: propulsion, navigation, autonomous controls, remote sensing, and locomotion in microgravity. The ambitious current and planned future missions will greatly expand our knowledge of these small bodies and the engineering required to operate spacecraft in their vicinity and on their surface. 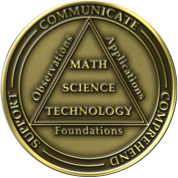 While commercial exploitation of dwarf planets, asteroids and comets still may sound like science fiction, the technical foundation for such activities is being developed now. It’s hard to guess how much progress will be made in the next decades. However, I’m convinced that the “U.S. Commercial Space Launch Competitiveness Act,” will encourage commercial investments in space exploration and exploitation and lead to much greater progress than if we depended on NASA alone. The technologies being developed also may lead, in the long term, to effective techniques for redirecting an asteroid or comet that poses a threat to Earth. Such a development would give our Planetary Defense Officer (see my 21 January 2016 post) an actual tool for defending the planet.